Taxidermy art: a rogue’s guide to the work, the culture, and how to do it yourself. From home-goods stores to hip bars, the Tate Modern to the most conservative decor magazine, taxidermy is everywhere these days. And for as long as there has been taxidermy, there have been people who are willing to push its boundaries – from the jackalope to Damien Hirst sticking a shark in a tank of formaldehyde. Unlike traditional taxidermy, these mounts are not meant to mimic reality and are instead used to artistic effect. Rogue taxidermy is at the cutting edge of this trend, featuring stunning, provocative pieces “not without a certain sly humor” (The New York Times). In this, the first-ever collection of rogue taxidermy, you’ll find a monkey with a fez and a martini glass, a jewel-encrusted piglet, a bionic fawn, and a polar bear floating balancing refrigerator. 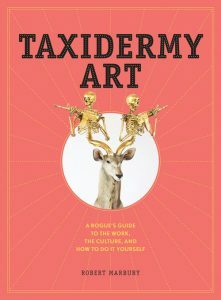 Author Robert Marbury makes for a friendly (and often funny) guide, taking readers through a brief history of taxidermy (and what sets rogue taxidermy apart) and presents stunning pieces from twenty of the most influential artists in the field. Rounding out this guide are six illustrated how-to lessons to get readers started on their own work, with sources for taxidermy materials and resources for the budding taxidermists.